It Is Time To Wake Up Everybody! Since the year of our Lord 1619, when people from Africa were first dragged onto American shores; they have been chastised, criticized, punished, beaten, robbed, and murdered all in the name of freedom and justice. All while the culprits have enjoyed wealth and prosperity, as a result, of our never ending allegiance and patriotism, often blindly. In the days of the past athletes we roll models and socially conscious; today they are mere high priced slaves, but when Colin Kaepernick made a passive statement of his outrage; it was like blasphemy! Even now when we have ascended to the White House, there are those who castigate much vial abuse upon this uniquely qualified man of African heritage. We are a unique people, a forgiving people, a steadfast people, and a brave people unlike any known to the world. It was our labor that built this country and responsible for the great wealth America enjoys to this very today. When you look at America’s enormous wealth, and the power derived from its tremendous control of resources, think about the sacrifices our families made to make all of this possible. We have looked out for this country for hundreds of years and still doing today, which is simply amazing. Upon our backs, laden with the stripes of punishment for what they believed was for discipline and in spite of our loyalty, diligence and tenacity – we loved America. Even when America refused to allow us even to walk in the shadows, we followed, believing that someday we would come to accepted and treated like men and women. Our strength in the face of adversity is vastly understated. Our history is one of unbelievable struggles. We’ve been brave on the battlefield, despite being classified as three-fifths of a man. This was, and is, outstanding and frankly beyond the call of duty considering that we have lived through slavery and under an Apartheid-like system. We have raised America’s children, attended to its sick, and prepared their meals while those forefathers were occupied with the trappings of the good life. Even during the times when they found pleasure in our women and enjoyment in seeing our men lynched, maimed and burned – we continued to watch over America’s soul. We labored in the hot sun for 12 hours to assist in realizing the dream of wealth, good fortune and made America a great world power. We were there when it all began, and you are still here today, protecting the system from those Black people who’ve the temerity to speak out against America’s past transgressions. It was us who warned about Denmark-Vessey, told you about Gabriel Prosser’s plans, called your attention to Nat Turner, Malcolm, and yes Martin too. It was us who sounded the alarm when old John Brown came calling on Harper’s Ferry, and there are still some sounding warnings today. Black Nationalism has died and as a result; our community brings 95 percent of what it earns to other businesses and keeps little for themselves in spite of the fact that other people controlled at least 90 percent of all the resources and wealth of this nation. We purchase things like Timberlands, Hilfigers, Karans, Nikes, and all of the other brands that I assume make people feel as if the system is giving back something for their patronage. After all, in the past, the brands and scares placed upon us were worn quite painfully, but those of today are proudly worn because they give a false sense of self-esteem. Our community’s super-rich; athletes, entertainers, intellectuals, and business persons, both legal and illegal, exchange most of their money for cars, jewelry, homes, and clothing. The less fortunate among us spend all they have at neighborhood stores, enabling other cultures to benefit by opening more stores and taking our wealth; this is the result of our not doing business with each other. In today’s business environment, we do not support each other and just keep doing business with the larger community or in fact any other community. Some say we were very successful doing this after slavery ended and even as recently as 1960, but you know what happens when you began to build your own communities and do business with one another – you’re pitted against one another and destroy ourselves. We dance, sing, fight, get high, go to prison, backbite, envy, distrust, and hate one another. Oh, let us not forget we pray a lot. We resisted the messages of trouble-making Blacks like Washington, Delaney, Garvey, Bethune, Tubman, and Truth for fighting and dying on the battlefield for us all. Yet, most have forgotten the names and take no reverence in their sacrifice due to a lack of reciprocity and equity. This includes our acquiescence to political agendas, abdicating our own economic self-sufficiency, and working so diligently for the economic well-being of other people. Even though the 13th, 14th and 15th Amendments were written, and many died for the rights described therein, we did not resist when they changed Black Rights to Civil Rights and allowed virtually every other group to take advantage of them for their progress. This goes beyond the imagination, irrespective of the many promises that have been made and broken. A lass don’t worry, when you die you will find a place where there is a mansion waiting for you and streets paved with gold somewhere in the sky. Moreover, we went beyond the pale when we allowed our children to be turned over to the American educational system. With what is being taught to them, it’s likely they will continue in a mode similar to the one we have followed for the past 45 years. Remember, Mr. Lynch when he walked the banks of the James River in 1712. He prophetically said he would make Africans slave for 300 years; little did he realize the truth in his prediction that this prediction has been realized. Did you ever wonder why white folk can’t face up to slavery and the sins of their fathers. First, let’s understand that they benefited greatly on the backs of slavery. Therefore, we should understand that slavery and racism is all about economics. Not to mention it is as American as apple pie! They, white people, know full well the wretchedness of what they have done; then and now but they can’t teach the truth. It is simply the devil and evil within them that won’t allow it because it is the foundation of White Supremacy!!! This news item shocked some. Two unnamed Academy members said they picked “12 Years a Slave” as their choice for best picture of the year. It subsequently got the award. The shock, though, was that the unnamed members candidly admitted that they did not see the film. They minced no words why. It was just too painful and disturbing to watch this kind of film. But this really shouldn’t be much of a shock. Facing the horror of slavery is a tough nut to crack not simply because it entails facing an inconvenient truth about past racial dehumanization, but because it entails facing the real truth that slavery still corrodes in big and little ways American life. This starts with the truth of why and how slavery became a respected and legitimate part of American life in the first place. The U.S. government encoded slavery in the Constitution and protected and nourished it for a century. Traders, insurance companies, bankers, shippers, and landowners made billions off of it. Their ill-gotten profits fueled America’s industrial and agricultural might. For decades after slavery’s end, white trade unions excluded blacks and confined them to the dirtiest, poorest paying jobs. While it’s true that many whites and non-white immigrants came to America after the Civil War they were not subjected to the decades of relentless racial terror and legal segregation, as were blacks. Through the decades of slavery and Jim Crow segregation, African-Americans were transformed into the poster group for racial deviancy. The image of blacks as lazy, crime- and violence-prone, irresponsible, and sexual predators has stoked white fears and hostility and served as the standard rationale for more than 4,000 documented lynchings between 1890 and 1945, as well as the countless racial assaults and acts of hate crime violence. Though some blacks earn more and live better than ever today, and have gotten boosts from, social and education programs, civil rights legislation, and affirmative action programs, the hideous legacy of slavery is still ever present. The National Urban League in its annual State of Black America reports yearly continually finds that young blacks are far likelier than whites to be imprisoned, serve longer terms, and are more likely to receive the death penalty even when their crimes are similar. Blacks continue to have the highest rates of poverty, infant mortality, violence victimization rates, and health care disparities than any other group in America. They are still more likely to live in segregated neighborhoods and be refused business and home loans. Their children are more likely to attend failed public schools than any other group, and more likely to be racially profiled on America’s urban streets. The U.S. government admitted it was legally liable in 1997 to pay the black survivors and family members of the two-decade long syphilis experiment begun in the 1930′s by the U.S. Public Health Service that turned black patients into human guinea pigs. The survivors got $10 million from the government and an apology from President Clinton. They were the victims of a blatant medical atrocity conducted with the full knowledge and approval of the U.S. government. The state legislature in Florida in 1994 agreed to make payments to the survivors and relatives of those who lost their lives and property when a white mob destroyed the all-black town of Rosewood in 1923. This was a specific act of mob carnage that was tacitly condoned by some public officials and law enforcement officers. Florida was liable for the violence and was duty bound to apologize and pay. The Oklahoma state legislature has agreed at least in principle that reparations and apology should be made to the survivors of the dozens of blacks killed, and the hundreds more that had their homes and businesses destroyed by white mobs with the complicity of law enforcement in the Tulsa massacre of 1921. A bill by Michigan Congressman John Conyers that has been kicked around Congress since 1989 to establish a commission to study the impact of slavery and the feasibility of paying reparations to blacks has gone nowhere in Congress. Reparations is simply too risky, divisive, and distracting for Congress to seriously consider. President Obama, however, has spoken at times about the need to spend more on education, job and housing programs as the best way to deal with the ills of the black poor. The brutal truth is that a mainstay of America’s continuing racial divide is its harsh and continuing mistreatment of poor blacks. This can be directly traced to the persistent and pernicious legacy of slavery. But from the comments and actions of at least some Academy members even watching a movie about slavery that’s set a century and a half ago is too much too take. And that tells why America still refuses to face up to its slave past. There was once a time and not too long ago when black music was rarely heard by the masses. The great music that African American performers created was not allowed to be played on the radio. It was called “race music”, however, the white performers stole this music. So many of those African American performers never made much money, if any at all as a result, and I am stopping short of calling this a crime, which is what it was. Then came a man named Berry Gordy, who changed the face of music. I would like to take this opportunity pay homage and say THANK YOU Mr. Gordy for Motown for your contribution to the world, our pride – as well as having the vision to know it was possible. Most people do not know or remember that before Motown Records few black performers enjoyed anything close to crossover success. Black music was, then, called “race music” and was segregated in the same manner as the rest of America before 1959, when Motown was founded. Let me also remind you that rarely could the face of a black person be seen on an album cover before Motown’s founding. By the way, an album is what was used for music before CDs. Motown was a company that primarily featured African American artists and its soul-based subsidiaries became the most successful proponents of what came to be known as “The Motown Sound”. This was a style of soul music with a distinct influence on all who heard it. 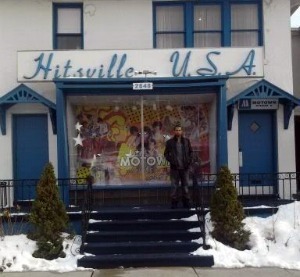 From its Hitsville U.S.A Building on 2648 West Grand Boulevard, Detroit, Michigan that served as Motown’s headquarters. The label produced the most universally recognized stable of songwriters and performers of our time or any time. From this tiny little basement studio, the world was introduced to Michael Jackson, the Supremes, Diana Ross, Smokey Robinson, the Miracles, Mary Wells, Marvin Gaye, the Temptations, Four Tops, the Commodores, Lionel Richie, Stevie Wonder, Jr. Walker and the All-Stars, David Ruffin, Eddie Kendricks, Gladys Knight and the Pips, Rick James, Nick Ashford and Valerie Simpson, Teena Marie, DeBarge, the Jackson Five, Martha and the Vandellas, the Marvelettes and Motown’s Funk Brothers studio band just to name a few of the artists that graced our souls and touched our hearts making us proud. Many of Motown’s best-known hits were written by Barrett Strong, Norman Whitfield and the songwriting trio of Holland-Dozier-Holland, who became major forces in the music industry. For example, it’s a known fact in the music industry that to get a number one hit song someone would have to write more than thirty songs. Holland-Dozier-Holland had a string of more than fifty hits in a row with some becoming number one with several different artists, like the hit “I heard it through the Grapevine”. This is profound and will never happen again. No songwriter will ever achieve this feat – guaranteed. Mr. Gordy did sell Motown, and it’s now in the hands of others. However, its legacy resides in a very special place in my heart, and I’m sure millions around the world. So again I say, thank you Motown for the music, the love, the magic, and the many great memories.